Find artworks, auction results, sale prices and pictures of Nicolau Antonio Facchinetti at auctions worldwide. Nicolau Antonio Facchinetti (Italian, 1824-1900) A view of Rio de Janeiro from Barrio Cosme Velho signed and dated 'N. Facchinetti 1885' (lower right) oil on artist's board 7 1/2 x 11in (19 x 28cm) Provenance Private collection, St. Paul, Minnesota, since 1982; Acquired from the above by the present owner. Nicolau Facchinetti was born in 1824 in Treviso, in the vicinity of Venice. The revolutionary year that rocked Europe in 1848 found him in Venice, completing his art studies and possibly being involved in a political movement that forced him to leave the country. 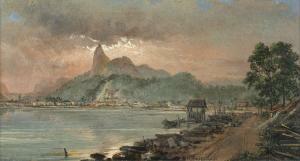 He embarked for Brazil in 1849 and settled in Rio de Janeiro, where he started his artistic career as a stage designer. After establishing a reputation for himself, in 1863 he earned a certificate as a lecturer in art at the Imperial Academy of Rio de Janeiro. Facchinetti devoted himself mostly to landscape painting and from 1870 he was encouraged in this subject by Princess Isabel, daughter of Emperor Pedro II, receiving the title of 'Landscape Painter of his Highness the Duke of Saxony in Brazil.' He also turned his attention to marine painting but is best known for his highly detailed, diminutive landscapes of Rio and Minas Gerais and their environs. His landscapes are infused with the warm light of a sunset or sunrise over a lush vegetation rendered in the greatest detail. Please note the additional cataloguing: The first dated 1878 and inscribed by artist (verso). The second is card laid to card, indistinctly dated and inscribed by artist (verso). After three years in Venice, he moved to Rio de Janeiro after the 1848-9 revolution. He worked there first of all as a scene-painter for a theater. In 1865 he earned his certificate as lecturer at the Imperial Academy in Rio. From 1870 he turned to landscape painting, which he taught himself, he was encouraged in this by Princess Isabel, daughter of King Pedro II. Between 1880 and 1890 he developed his marine painters. Facchinetti was a naturalistic painter of open-air school; the accuracy of his landscapes was of first importance to him, which is why he nearly always annotated his works with details of the precise time and place depicted. 4¾ x 11½in. (12.1 x 29.2cm. ).